These are 100% new Scirocco-Style Crossflow Radiators intentionally engineered and designed for the Professional and Sportsman racer alike. They provide improved airflow while creating less drag. 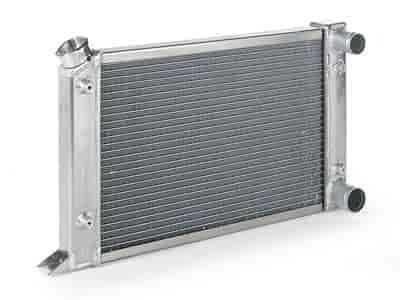 The majority of these Scirocco-style crossflow radiators feature a performance-grade, dual 1-inch core except for the single 1-inch core featherweight design Scirocco-style radiator (p/n 134-69009). Every radiator in this series features ''form-folded'' coolant tanks that are constructed of .080'' wall aluminum. The coolant tanks are vastly superior and much safer than OEM-style plastic end tanks. Additionally, Be Cool's radiator core technology is more dependable and prevents core failures. These single pass design models feature a -20AN inlet/outlet or 1-1/2'' slip-on hose inlet and 1-3/4'' slip-on hose outlet. Additionally, all versions of these radiators are constructed with ''twist resist'' upper and lower protective aluminum core rails for extra rigidity and are designed for simple yet effective universal cradle mounting. Each radiator is 100% pressure tested before being shipped in expanding foam packaging. Be Cool has more than ten years of research, extensive in-field testing and development that led to their Competition Module Assemblies. They take the guesswork out of properly cooling your vehicle because every component in a Be Cool Module Assembly has been carefully matched for peak efficiency. Radiator Modules include a Be Cool aluminum single or dual core crossflow radiator with oval fluted tubes and loose fin design, a high-torque, euro-black electric puller fan, aluminum pro-style fan mounting brackets and all necessary wiring.